Mars goes greater distance and takes more time to orbit around the sun than distance Earth goes and time Earth takes, since Mars’ orbital path stretches longer over its elliptical circuit than Earth’s also elliptical orbit takes. Mars’ summers, when Mars passes passes closest to the sun and warms, lasts longer than Earth’s summers. The length of Mars’ winters, when it’s colder and farthest from Solaris lasts longer than Earth’s winters. Mars’ seasons last twice as long as Earth’s. 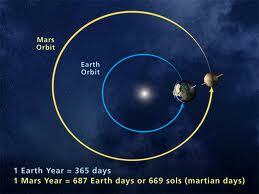 Both Earth and Mars rotate on their own axes in about 24 hours, so they have equivalent cycles of day and night. Enki said he’d rocket to Earth and see if it had enough gold to send miners. “If from gold dust of Earth a shield for Nibiru its atmosphere to save,” said Enki, “let Alalu Earth rule as King. For kingship on Nibiru, let him wrestle Anu. Let me in a chariot [rocket] to Earth journey, a path through the Bracelet [Asteroids] with water, not fire I shall fashion. On Earth, from the waters let me the precious gold to obtain; to Nibiru back it will be sent.” So Anu sent son Enki to Earth to mollify Alalu. Enki could mediate between Anu and Alalu, since Alalu was Enki’s father-in-law. Enki diverted water from the ship’s engine-cooling system to a water cannon. With the cannon, he blasted rocks from his course though the asteroid belt. “Critical Water depleted,” Anzu warned; “engine failure immanent.” Mars’ waters could save them. Enlil subdued and tied Alalu while Enki gave Anu first-aid. Anu groaned, “Maroon Alalu on Mars, I shall. Slowly will he die from my flesh ingested, “His flesh killed anyone who ate it. On Nibiru, Anu ordered freight rockets to shuttle from Earth and its moon, as well as other planets and satellites between Nibiru and the sun. On the shores of a lake on Mars Ninmah found Alalu Theand Anzu dead but she revived Anzu. To honor Alalu who found the gold that could save Nibiru, “The image of Alalu upon the great rock mountain [Cyndonia] with beams they [Ninmah’s crew and Anzu] carved. They showed Alalu wearing an eagle’s helmet; his face they made uncovered.” Alalu’s head, the Cyndonia statue, climbed a full half mile. Before she left Mars for Earth, Ninmah, as Anu had ordered, gave Anzu twenty astronauts from her company and told them to build a way-station for the gold freighters. * They, and later shipments of workers built three pyramids, which they used as power stations for the complex they built near Alalu’s statue. * [ZS, Genesis: 232 -271; Enki: 104]. From Marsbase, Anzu ruled 300 Nibirans, a space station that circled Earth and the shuttle service. Either Nibiran space-station personnel or some earlier space travelers had moved two water-bearing asteroids into artificial circular (not elliptical, like non-artificial) orbits around Mars’ equator. These are Mar’s two moons, Deimos and Phobos. Phobos circles Mars 3.5 times each Martian day.The Nibirans or their predecessors on Phobos enlarged caverns on the 17 x 13 x 12 mile large Phobos, a mere 5,800 niles from Mars. The fashioners of this base made a hollowed-out base there on Phobos. The Phobos base was sheltered by miles of rock from radiation and meteorite bombardment. Enki, however, told Enlil to show the gold mining, refining and transport system to Anzu. “Get Anzu to keep his men on the job.” So Enlil told Anzu, “Let’s cover ourselves with sterile clothes for the restricted area.” But when Enlil stripped, Anzu stole his keys, slipped into the control room and seized the crystals [computers] that ran Sumer’s spaceport and cities. Anzu forced pilot Abgal to take him to the spaceport, Shu.ru.pak, where Anzu’s men declared Anzu King of Earth and Mars. Anzu turned off vital services at headquarters (Nibru-ki), cut Earth-Nibiru communications, and, from his aircraft, buzzed Enlilite positions. Ninurta launched his jet and shot Anzu down. Then the Ninurta freed Abgal, retrieved the crystals that controlled the Expedition’s facilities. Finally, the Champ captured Anzu and dragged him before Enlil. When Nibiru crossed between Jupiter and Mars, Nibiru’s gravity jounced planets and disrupted Nibiru’s atmosphere. When, 300,000 years ago, Nibiru crossed, hurricanes and “brimstones” hit Earth’s Moon. The crossing agitated atmosphere, ignited volcanoes, and loosed mighty earthquakes on Earth. Nibiru’s crossing battered Mars too then. It ruined the astronaut base, destroyed the smelting plant and wrecked the transshipment warehouses on Mars. Marduk, Mars’ manager, asked Enlil to employ him on Earth. Commander Enlil beamed King Anu on Nibirum who replied: No more gold transshipment from Mars. Rockets had to take gold right from Sumer to Nibiru. So Anu ended gold transfer on Mars and with it, Marduk’s job as Operations Boss. Out of a job, and passed over for command of the Astronauts on Earth–Enlil gave that job to Marduk’s cousin Utu–Marduk proclaimed he’d marry Sarpanit, daughter of his dad’s Adapted Earthling overseer, Erkime. In 3450 B.C., Enlil let Marduk and Sarpanit wed at Eridu [Basara]. But he ordered the couple, after the ceremony at Eridu, to retire to Egypt (henceforth Marduk’s fief) within Enki’s Africa. “A great multitude of Civilized Earthlings in Eridu assembled. Young Igigi from Lahmu [Mars] in great numbers came.” They captured 200 beautiful Earthlings and forced Enlil to let them settle on Earth and build lineages. When, 13,000 years ago, the Deluge threatened, Enlil ordered Marduk to shelter on Mars and Marduk’s allies, the lineages the Igigi from Mars had begat, to shelter atop Earth’s peaks till the waters receded. To Baalbek [Lebanon] Enlil summonsed Nibirans who, on Earth’s peaks, survived the flood and the astronauts in spacecraft that orbited the planet. He also called in Nannar from the Moon and Marduk from Mars. * Thousands of years later, Marduk’s armies threatened Enlil and his Enlilite lineage. Enlil shifted the Nibiran gold-shipping from southeast Africa to Tianhanaco and Pumapunku atop the Andes. At Tiahuanaco Ninurta and Adad-Viracocha laid out power-generator and space-marker pyramids. On Mars’ “Inca City” area, Sitchin discerned interlocking huge stone blocks, like those found at Sacsahuaman, Peru. A chunk of these blocks, probably moulded into a cement with the Anunnaki equivalent of our Brown’s gas, buried itself as a meteorite in Antarctica [Mariner 9 photo frame 4212-15]. Anunnaki pyramids on Earth, and probably on Mars too, amplified vibrations from the planet pumping stagnant water beneath them, boosting it with the controlled explosive release of hydrogen gas and further magnified with crystals to meet their power needs. Nibiran-built pyramids on Earth, and probably on Mars too, amplified vibrations from their planets. The pyramids pumped stagnant water under them. The pumped water sent a pulse upward in the pyramids. To boost this ascending pulse, they fed hydrogen chloride and hydrated zinc though stone ducts into an explosion chambers. The HCL and zinc combined in the chambers and sent an ongoing controlled explosive release of hydrogen gas upward through a series of crystal amplifiers. The pulse thus enhanced exited the tops of the pyramids as perpetual microwaves out the pyramids tops to meet their power needs. Our probe, Mariner 9, registered two pairs of pyramids on Mars. One of the pyramid pairs on Mars measured two miles across and half a mile high [Mariner 9 frames 4205-78, 4296-23; ZS, Genesis: 2462 -246]. The Anunnaki set out Earth’s pyramids in Giza and Tiahuanaco exactly as they’d set out Mars’ pyramids just west of Alalu’s statue at Cyndonia. Near Cyndonia, they raised beds of crops they irrigated from canals that reached the nearby lake [NASA Frame 52-A-35, Plate L]. On both Mars and Giza, the Nibirans marked their pyramids’ entrances with statues. On Mars, the mile-high statue that fronted their big pyramid featured Alalu’s face [Viking photo 76-A-593/17384]. Alalau’s head rose a half-mile above Mars’ plateau. 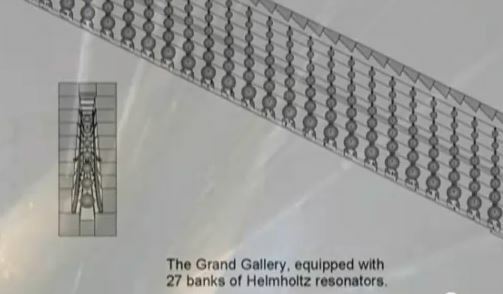 In Egypt, Anunnaki built the Giza complex around 10,500 B.C.. There they first put the face of Ningishzidda-Thoth, who designed the complex, on the statue of a crouching lion (Sphinx) that marked the pyramids. Other photos of Mars “show tracks on an escarpment above the great canyon in the Valles Marineris near the Martian Equator.” These tracks, like those at Nazca, crisscross in a way that natural tracks would not. At Tiahuanaco, canals connected the Nibirans’ structures to Lake Titicaca, just as on Mars, canals connected their structures to an adjacent lake. The nearing (perigee) of Nibiru to the inner solar system, 11,000B.C., destroyed the Nibiran space facilities in Iraq. The nearing also threw a huge boulder on the north wall of the big pyramid on Mars, just west of Alalu’s statue. The wall of this pyramid on Mars crumbled in the great onslaught. The rain of debris and proximity of Nibiru to Mars also vaporized Mars’ surface water and stripped away its atmosphere. The north corner of the pyramid just west of Alalu’s statue at Cyndonia was crushed by a huge boulder, probably during the same 11,000 B.C. nearing of Nibiru to Earth, the same perigee that caused Earth’s Deluge. The smashed pyramid at Cyndonia was fed water from the nearby lake by “an array of large piers, just as at Pumapunku [ZS, Genesis: 232 -271; Plate H]. Overwhelming evidence from a plethora of impeccable witnesses have, IMHO, clearly established the presence of the Greys. They may have a base on Mars’ moon, Phobos. Astronaut Buzz Aldrin reported sighting a huge monolith on Phobos. The monolith seems similar to those the Anunnaki (Homo Sapiens from the planet Nibiru who settled Earth 400,000 years ago) used for the power grid they established on Earth with monoliths like Stonehenge, statues on Rap Nui and in Indonesia’s Bada Valley and diorite stone balls in Costa Rica and Bosnia. 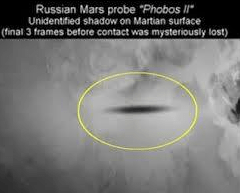 The missile or rocket that brought down the Phobos II probe seems to have come from Phobos (see the shadow of the missile or rocket, recorded just before our probe disappeared). Zecharia Sitchin, in Genesis Revisited, speculated, the Greys still maintain a base on the Phobos, the moon, and that a craft or ICBM from that moon destroyed Phobos II, the probe. THE APOLLO 11 MOON BASE COVER-UP MYSTERY. According to the NASA ASTRONAUT NEIL ARMSTRONG, the ALIENS have a base on the MOON and told us in no uncertain terms to GET OFF and STAY OFF the MOON. According to CONFIRMED REPORTS, both NEIL ARMSTRONG and EDWIN “BUZZ” ALDRIN saw UFOs SHORTLY AFTER the HISTORIC LANDING on the MOON in APOLLO 11 on 21 JULY 1969. During the TELEVISION TRANSMISSION, one of the ASTRONAUTS refer to a “LIGHT” in or on a CRATER, followed by a REQUEST from MISSION CONTROL for FURTHER INFORMATION. Then NOTHING MORE was HEARD. APOLLO 11: These “Babies” are huge, Sir! Enormous! OH MY GOD! You wouldn’t believe it! I’m telling you there are other spacecraft out there, Lined up on the far side of the crater edge! They’re on the Moon watching us! According to a DR. ALEKSANDR KASANTSEV, BUZZ ALDRIN TOOK COLOUR MOVIE FILM of the UFO’S from INSIDE the MODULE, and CONTINUED FILMING them after HE and ARMSTRONG WENT OUTSIDE. BUT, it was back on EARTH that NEIL ARMSTRONG give more detail to a NASA PROFESSOR (No name given). “PROFESSOR: What REALLY happened out there with Apollo 11? NEIL ARMSTRONG: It was incredible, of course we had always known there was a possibility of Aliens, the fact is, we were warned off! (by the Aliens). There was never any question then of a space station or a moon city. NEIL ARMSTRONG: I can’t go into details, except to say that their ships were far superior to ours both in size and technology – Boy, were they big! and menacing! NEIL ARMSTRONG: Naturally – NASA was committed at that time, and couldn’t risk panic on Earth. But it really was a quick scoop and back again”. NEIL ARMSTRONG CONFIRMED that the STORY was TRUE but REFUSED to go into further detail, beyond admitting that the CIA was behind the COVER-UP. The TRUTH he as now taken to the GRAVE. Until the ALIENS are ready to SHOW THEMSELVES!! ASTROPHYSICIST CLAIMS PHOBOS IS A GIANT SPACESHIP ORBITING MARS.